Agents daggers are the smaller knives carried by clandestine operatives and some military personnel. They range in size from 3/4 to 7/8ths of the standard Fairbairn Sykes knives. Produced by many firms and privately by small production cutlers: i.e J. Paisley, Sinclair, Alcock & Pierce, Bruce Hand, HG Long, Wilkinson Sword, Wm. Rodgers, Phoenix Iron Works, etc. Below: Completely sterile punch daggers obviously made by the same person. The handles are cast iron or steel. The longer blade is a simple round spike while the smaller one has the blade forged into a tri-corner shape. Thes may have been made/used in WW-1 and/or WW-2. The workmanship is quite good. Unfortunately there are no sheaths, if there ever were. The original copy of the "Hands-Off!" book was donated by my good friend on the west coast. 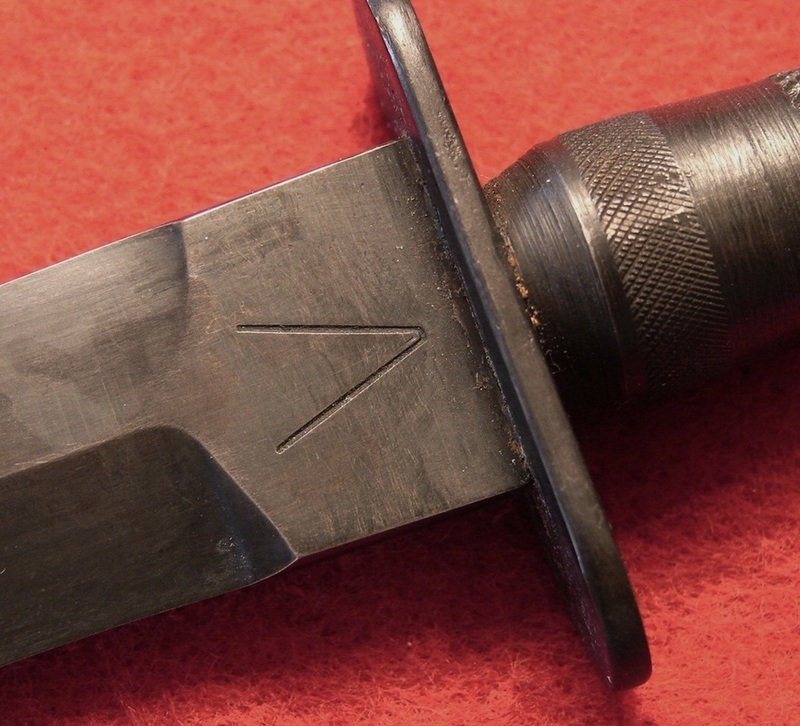 Below: Latest Mission Dagger is made from a Wilkinson 1888 Lee-Metford bayonet. This little knife is an exceptional addition to my collection. 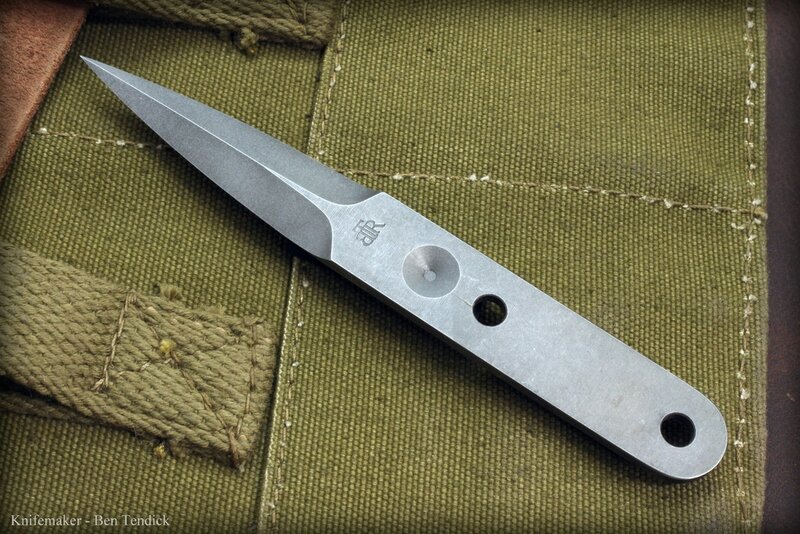 It is the only Mission Knife I have made from a bayonet. It is very stout and is sharpened only on the reinforced tip. Mason referred to these as "Strong Point" blades and indeed it would be unbreakable. 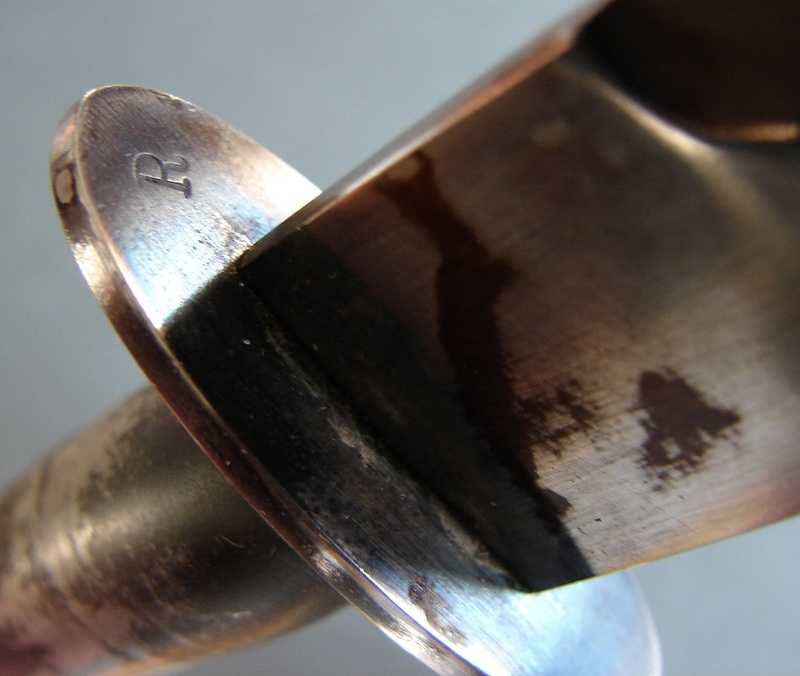 Slab aluminum handles are held in place by brass or copper pins through the original rivet holes in the tang. Below: You might think I have gone crazy, but for some reason these two S.O.E. hatpins have captured my heart more than any of the full sized F-S daggers I have bought recently. Maybe it is the absolute primal function they serve as assassination tools. There is no other purpose these weapons can fulfill. The blades are like miniature small swords, triangular and grooved giving them the rigidity necessary in a thrust. They are long enough to reach the heart or the brain, causing instantaneous death. They would leave hardly any trace of their sinister deeds. To sweeten the deal I got them for a very reasonable price. Sometimes I think there really is a dagger-stiletto fairy. Below: A lovely photo contributed by Leroy Thompson for use in my book. 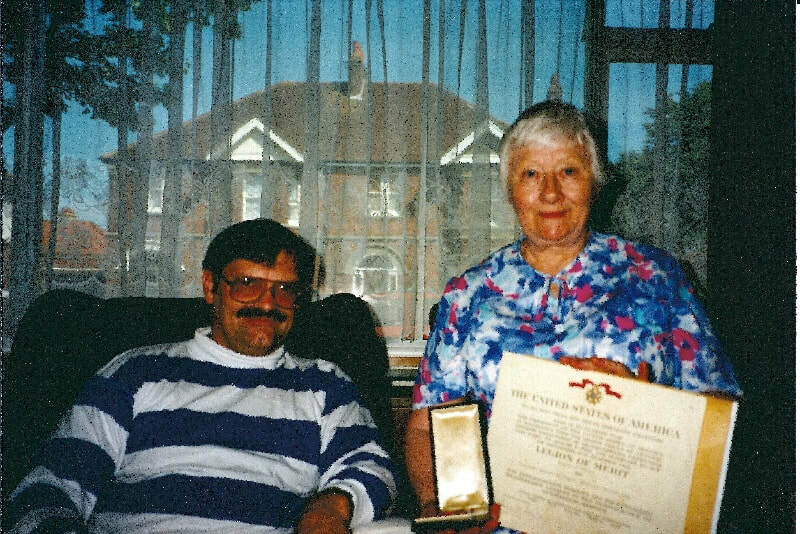 It is Leroy and the late Ms. Dorothea Fairbairn in her Father's home in England. Ms. Fairbairn was assigned at at Station XII where she served in MI5. She was later transferred to the India Mission at Poona, India along with some of her Station XII cohorts. 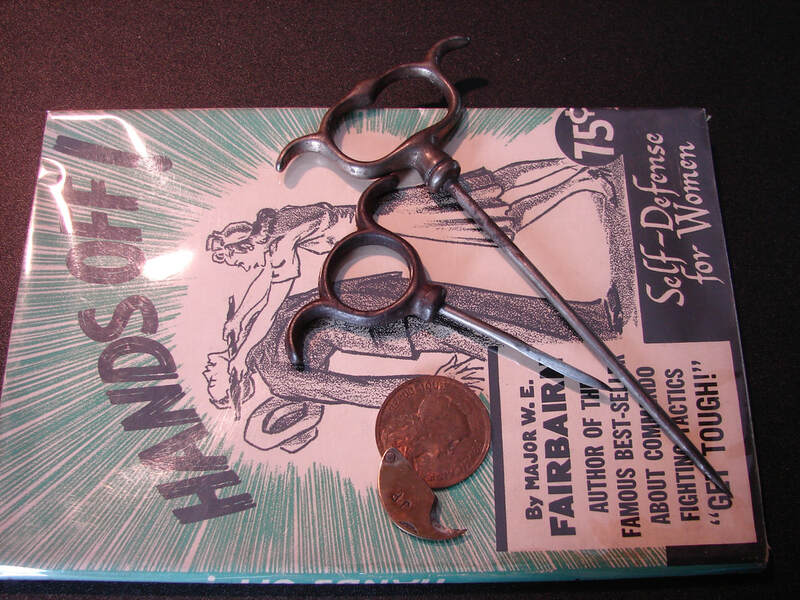 She was trained in Hand to Hand by her father William E. Fairbairn and served as a model in his book on women's self-defense named "Hands-Off." She is holding a Legion of Merit and medal awarded to her father. She clearly has her father's features. Thank you Leroy for the great photo! 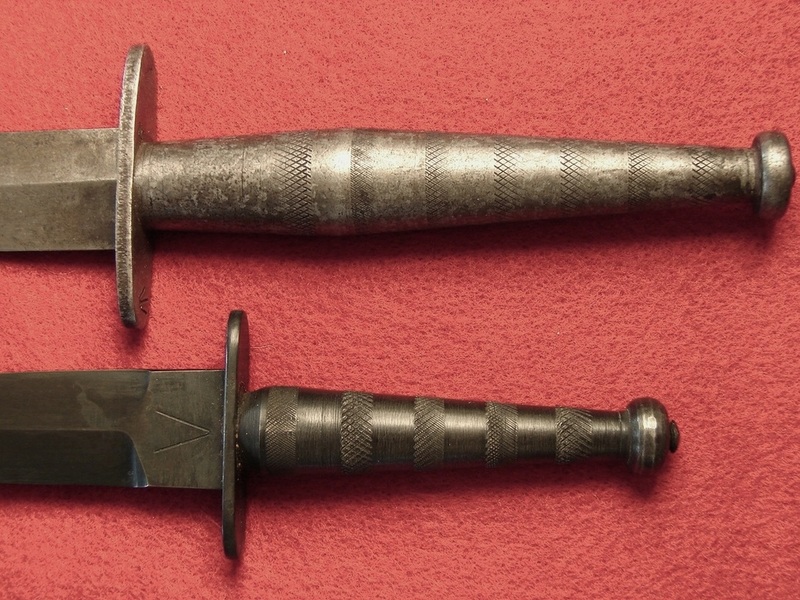 Below: This second pattern and sleeve dagger were both found at Dieppe. They both exhibit serious rusting, although the finish on the brass handle of the Second Pattern is mint. The third piece is a thumb dagger my friend bought at an Arms Fair in England many years ago. No markings on any of the pieces. 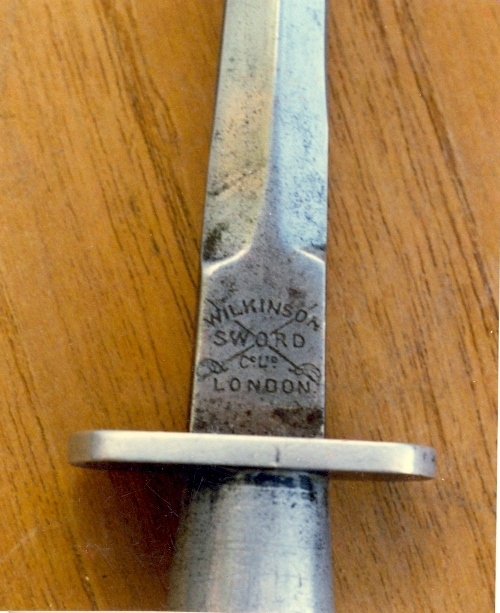 The thumb dagger appears to be made from a bayonet tip and this one is ground single edged. The tri-cornered blade of the sleeve dagger is razor sharp. Arms expert Paul MacDonald thought it looked to be made from forged wrought iron based on photos I sent to him. There is a long, somewhat open grain to the metal that is perhaps the clue to its manufacture. 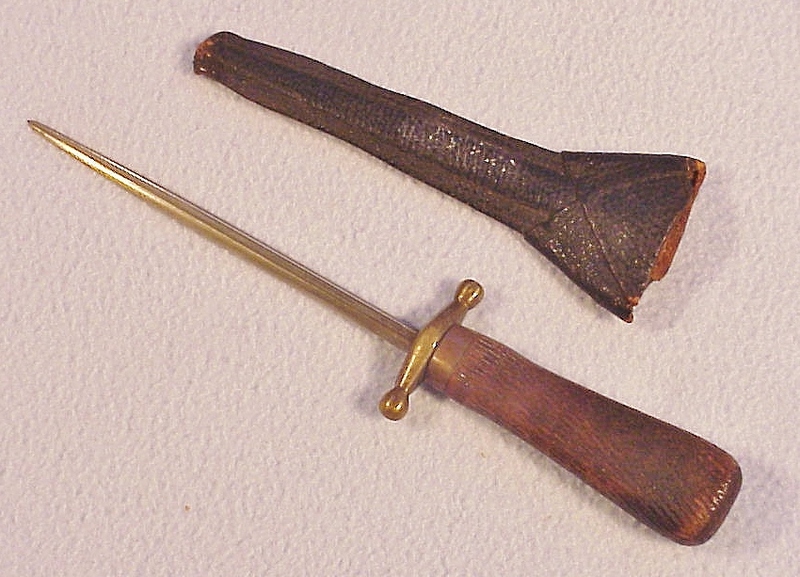 Below: Here is an absolutely mint thumb dagger and sheath. The thumb dagger is a lovely golden heat temper color. 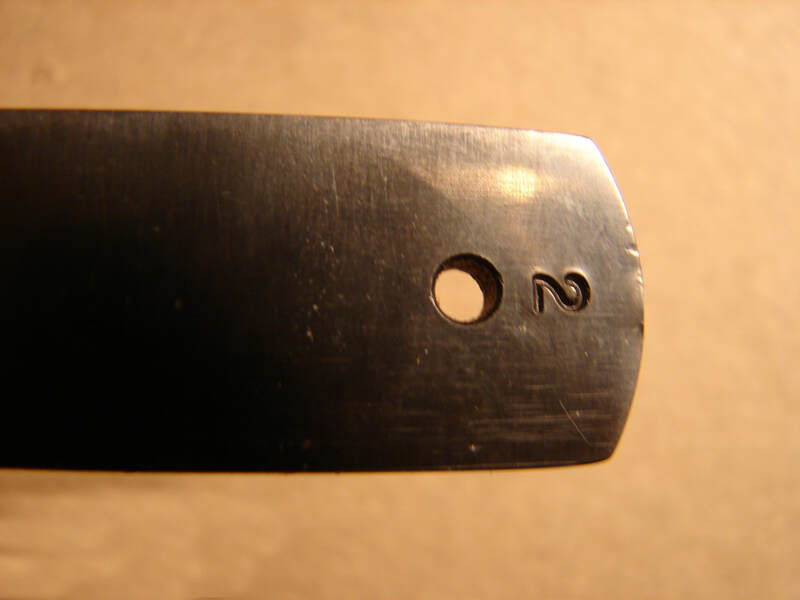 Stamped S.294 which is a number associated with Wilkinson Sword Co.
Below: A tiny bodkin designed to slide down in a trousers side seam or in the Agent's fly. Therefore there was no need for a sheath. The shaft is stamped A&P. Below: This is a utility knife, sleeve dagger, shiv, whatever you prefer to call it. It is double edged and sharp as Hell. Trust me it will cut flesh! the entire knife is blued and the handle is cord wrapped. Simplicity is its prime virtue. The initials for Wm. Rodgers and their code number "2" are present. Below: An S.O.E. 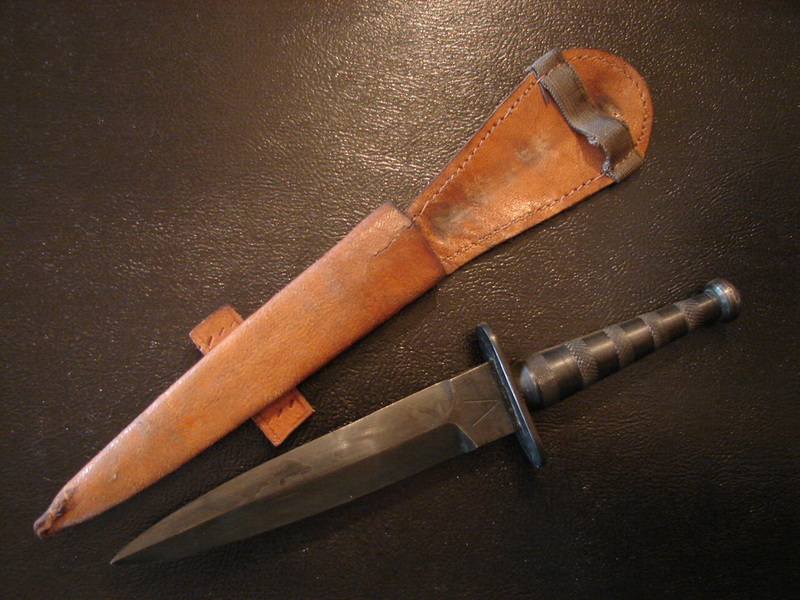 spike dagger theater-made from a piece of bayonet wrapped with a leather cord for the handle. It is complete with its original leather sheath designed to be worn hidden inside a trousers waist band by a suspender button, inside jacket button, or sewn into a trousers pocket or other clothing. The makeshift frog shows needle holes from sewing. This piece came out of Leiden, Netherlands. it is tiny, only about 6 3/4 inches long overall. One authority suggested maybe it had belonged to a member of Inter-Allied Cdo. No. 10 which he said had a large contingent of Dutch fighters. Below: Here is a commemorative Commando Nail I bought on Ebay. It is made by H.G. Long and was marketed by the American Historical Foundation. The gold plated nail is set in a fitted mahogany case along with a leather sheath, arm strap, and its certificate of authenticity. Today these sell for almost as much as an original. The three sided blade is quite sharp despite the plating. Below: Likely this is a WW-I stiletto but it was so sweet I could not pass it up. Besides it could have been used in WW-II. My best guess is it was made by or for the French Resistance. 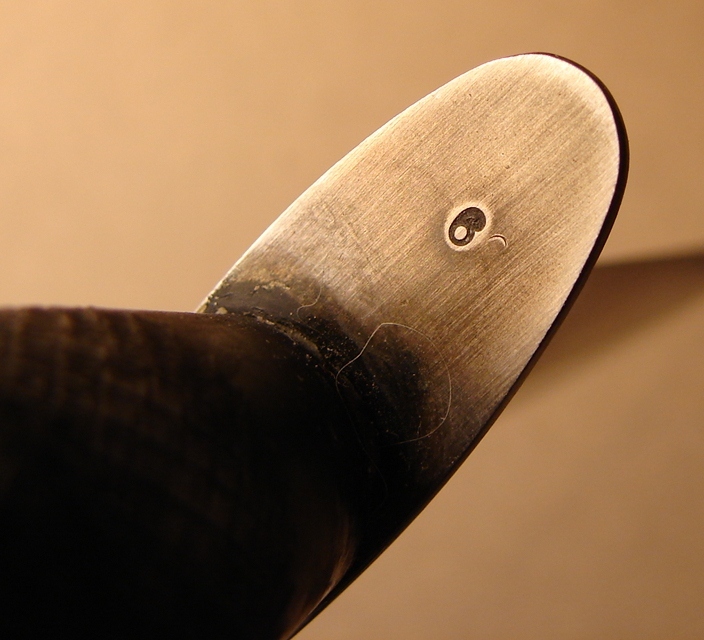 The blade is cut down from a Lebel bayonet. The guard and handle are very well done and tight as new. 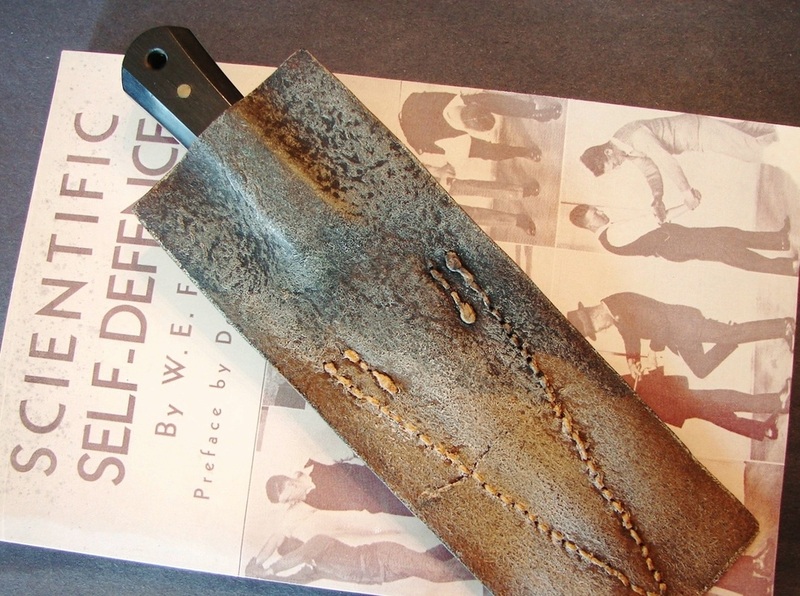 A molded leather pouch style sheath holds it securely in place but lacks any form of attachment. Probably carried in a boot or coat pocket. Below: Here is the third agent's dagger I bought from Roy Shadbolt. It is an unusual Brass handled one, but it is not unique. Dr. Windrum illustrates an Identical one in his book but he says the scales are more of a silvery color, possibly German Silver. One scale on both knives is grooved whilst the other side is smooth. Despite the cold look of the knife it is quite pleasant to handle and is reasonably sharp. The sheath is typical of many we have seen on these knives. I suspect the knives were boxed up and sent to a leather worker for fitting with sheaths. 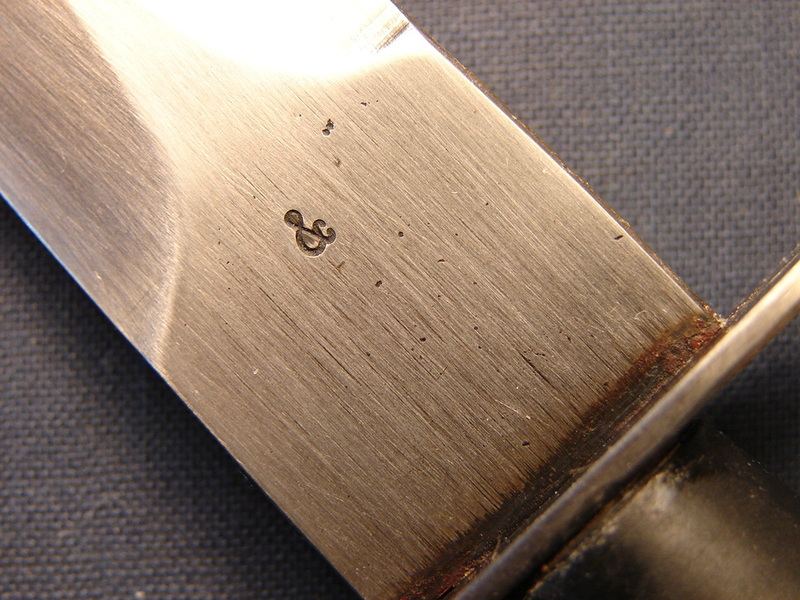 The only identifying mark is a "4" on the blade. This could be for Cdo. 4, a serial number, or for Phoenix Iron Works. The letter is a copy of an original WW-II love letter home to a sweetheart. You may soon find some replicas of this knife available for purchase. Contact MacDonald Armouries in Edinburgh if you would be interested in buying a reproduction of this knife. Tell him Dave sent you. Below: The top dagger is the second of the three from Roy. It has a lovely ringed walnut handle and oval steel guard. A temper colored blade is finely ground and held in place by what appears to be a gold plated top nut. 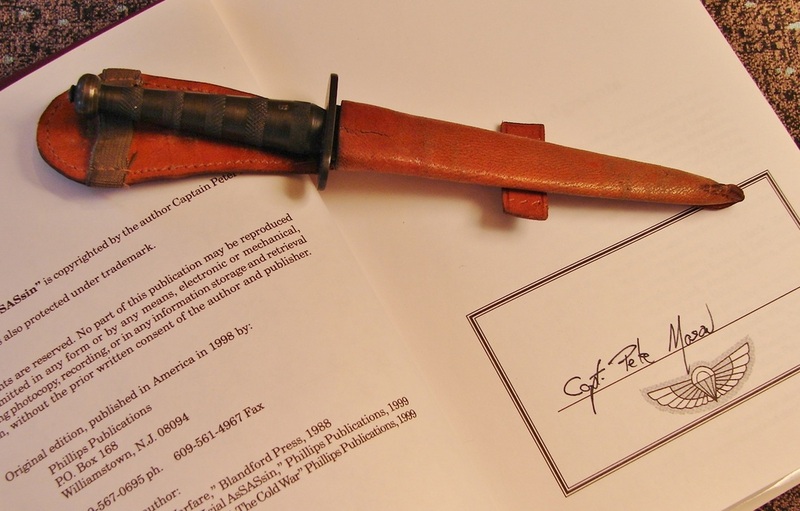 I believe this dagger is a WSC production piece based on the photo below this one. Below: I know it is hard to see but it is a photo I was given. The handle has the same set of five rings in three groups and the blade grinds match. The tang is clearly stamped "WSC." 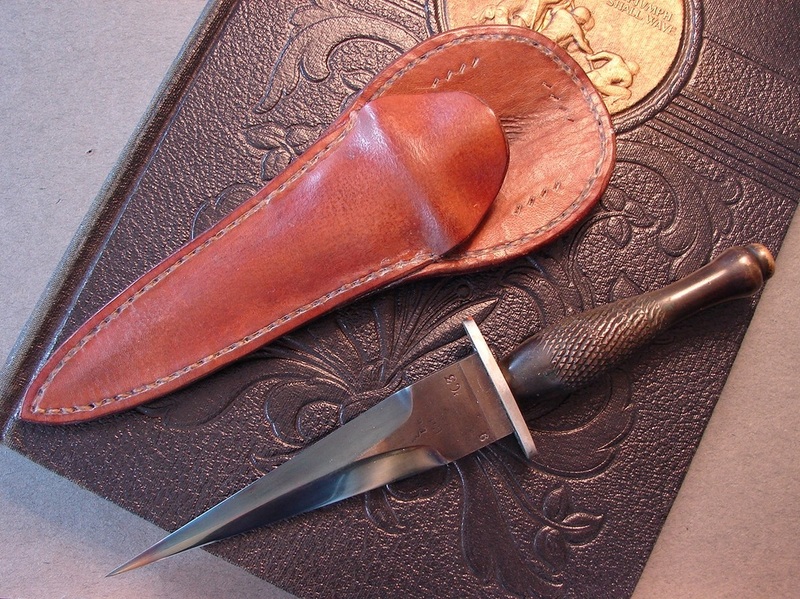 John Paisley Dagger Below: Here is the first of the three daggers I bought from Roy SHadbolt. Sometimes these particular knives are referred to as "Mission Knives." (I still have some nice knives for sale on the sales page.) This unique Paisley dagger has ebony scales held on by brass pins. The blade is unsharpened consistent with Paisley's philosophy. Nicely polished it is marked with his simple J.P mark. 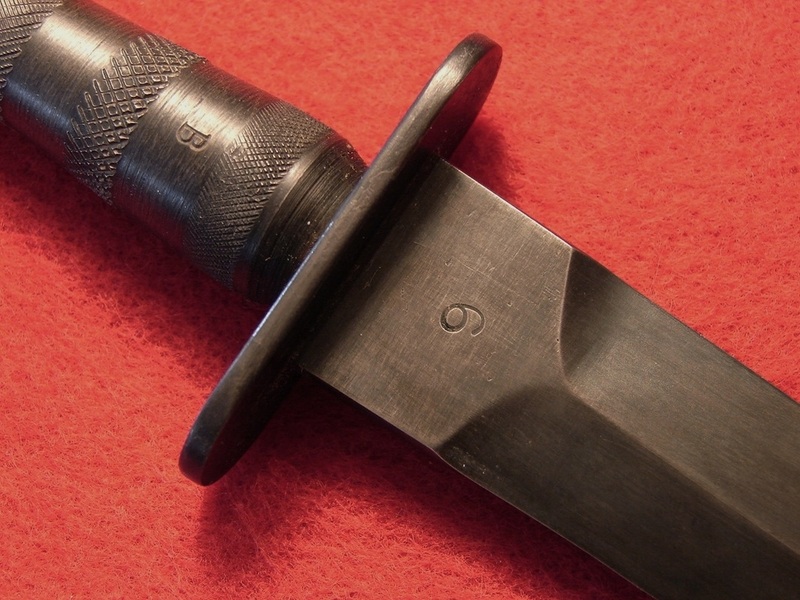 Of interest is the shape of the abrupt blade tip which reminds me of the Australian Commando Knives by Whittingslowe. You can see the same shape on the brass handled knife below. I have photos of others shaped exactly the same. Based on the discoloration of the leather on the backside of the sheath I think this knife may have been carried in a boot or in the waist. Discoloration like this often is caused by sweat. Given the opportunity, I decided to add this piece to our collection, not because I think they are especially attractive (like the X-daggers or First Patterns) but because it had a solid provenance and link to an actual S.M.P. instructor and the S.M.P. arsenal. 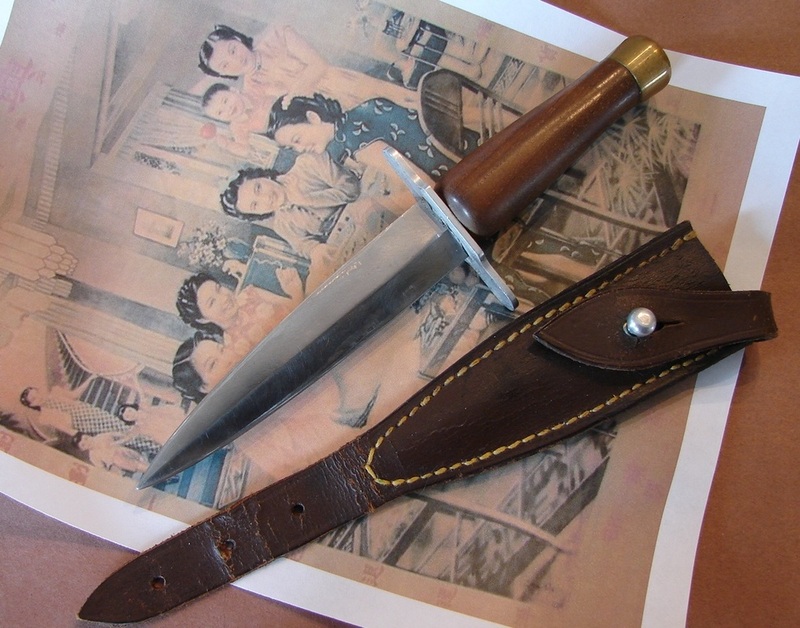 This knife came from a member of the Shanghai teaching staff that traveled to the UK where he taught during the war. It was purchased in England, after the war, directly from the veteran. 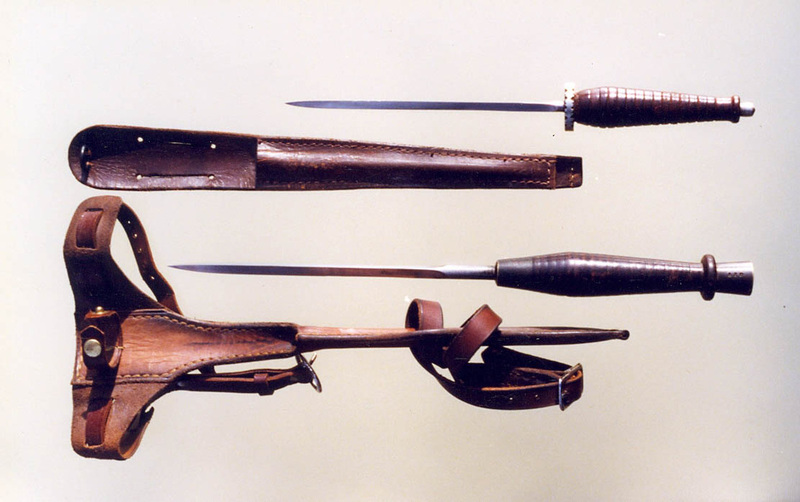 The upside-down-carry sheath is a later replacement, but of a period style, provided by none other than Gieves and Hawkes. It is exciting to imagine that perhaps Sam Yeaton himself could have worked on or made this knife. Again, if only the knives could speak. The handle appears to be made from a piece of polished antler. It does not have the luster of Ivory nor the porosity (at the ends) of bone. Noted collector Tom Parker at one time owned a very similar one (photos of his can be found on the internet). 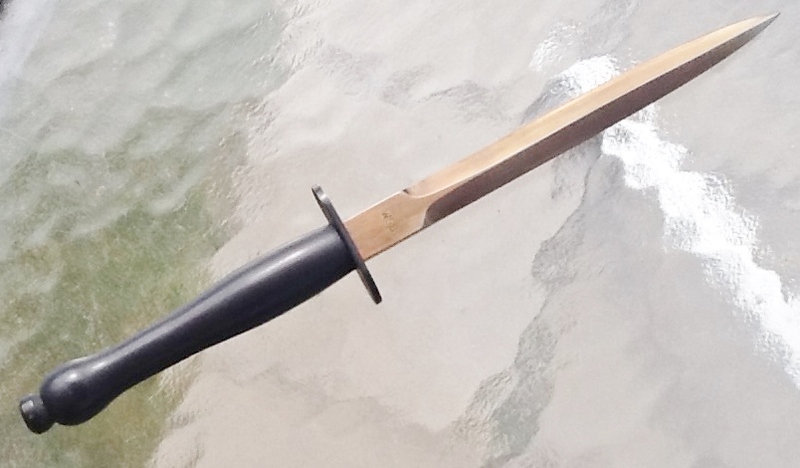 This blade is definitely made from the tip end of an 1888 or 1903 bayonet and the hollow grinds of the original blade are visible as well as the flat median ridge. 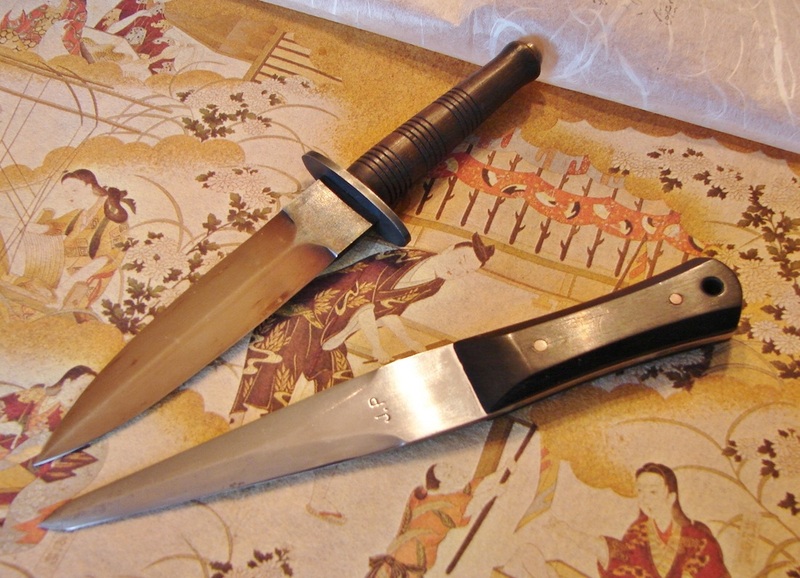 A copper habaki (blade collar) is extremely well made and fitted. The guard, although installed a little bit crooked, is hand engraved with a "tulip". According to some people this was the Armory's mark. 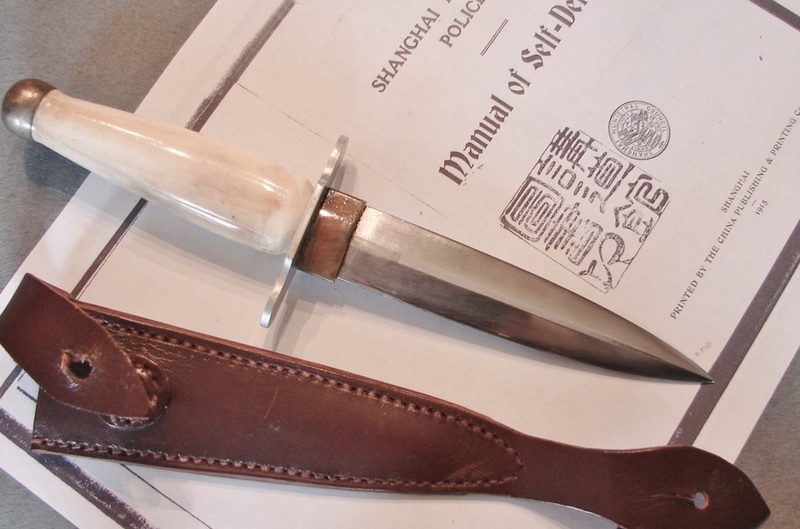 Below: One of the latest additions to our collection, a Shanghai Dagger from our good friend in Canada. It is stamped 1933 under the handle and is said to be one of the earliest and shortest of the known examples. 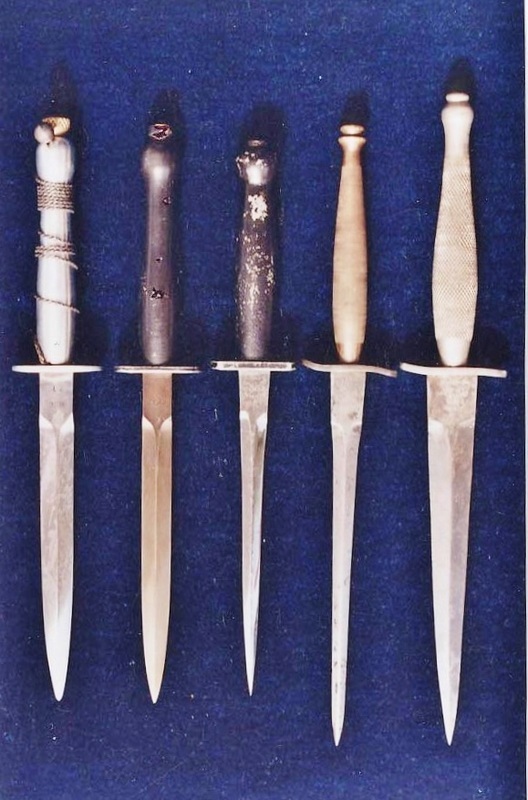 Below: An assortment of very rare Agent's daggers. The one on the left incorporates a gigli wire garrote. The addition of the garrote was not a very suitable solution, making for an uncomfortable grip and a clumsy garrote. I cannot imagine trying to apply the garrote without injuring yourself on the knife blade in the process. For those of you who might not know, a garrote is a wire or cord used to strangle a person. 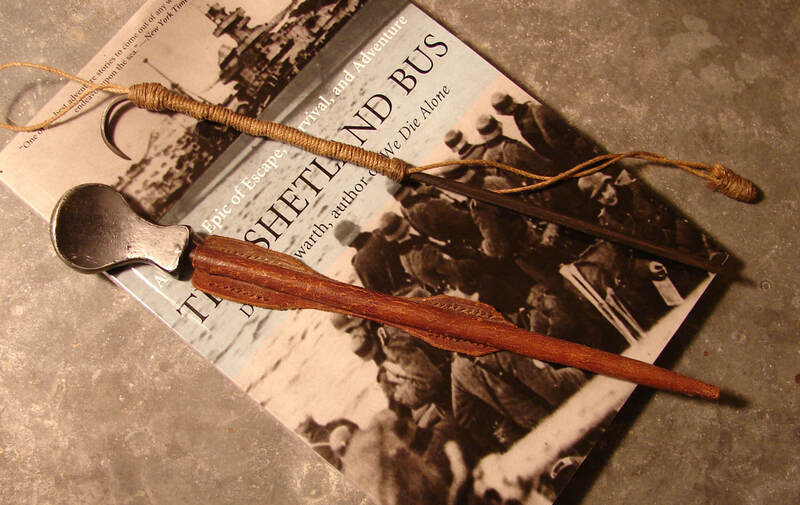 We have learned that a British Marine designed the garrote-knife but it never went into production. The knife second from the right, is one of the rarest knives we own. More about it on the page for first patterns or rarest of the rare. 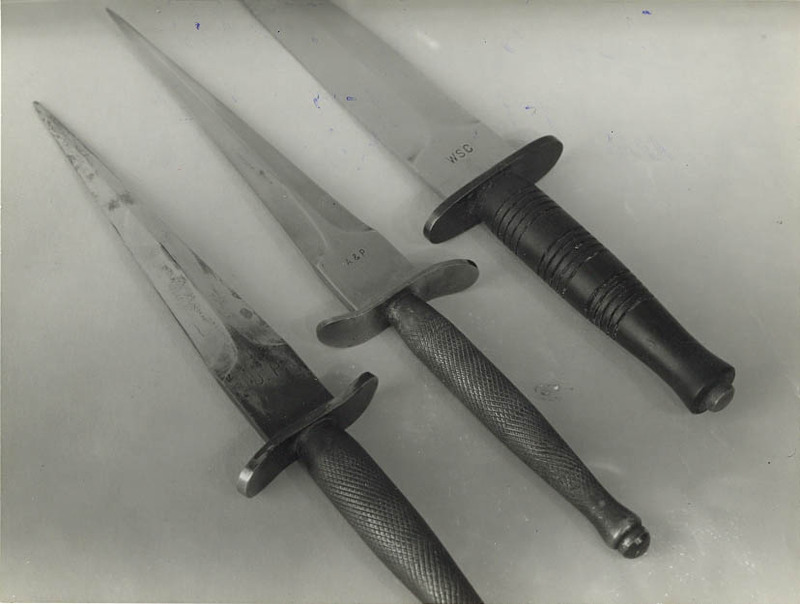 Below: The Agent's dagger on the left is marked "J.P" for John Paisley. The middle one is by (A&P) Alcock & Pierce, the one on the right is by "WSC." 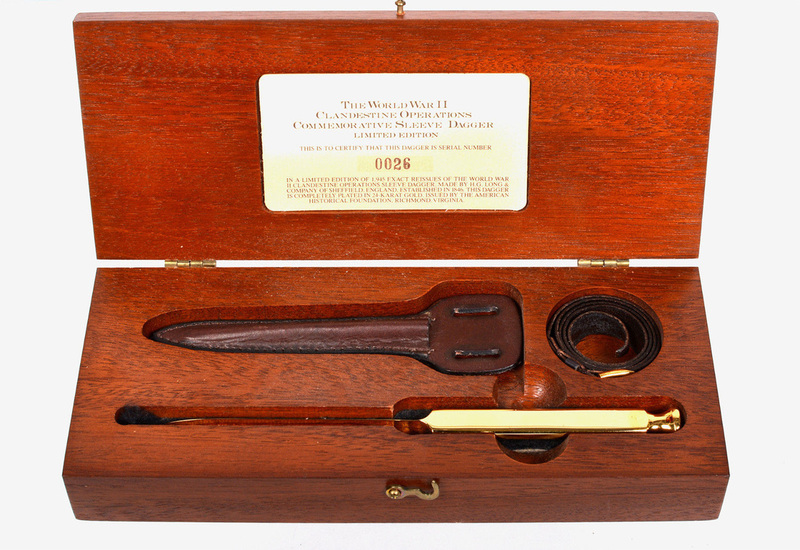 Below: A very fine WSC dagger from the Mason Collection. More about this knife can be found on the Rarest of Them All page. 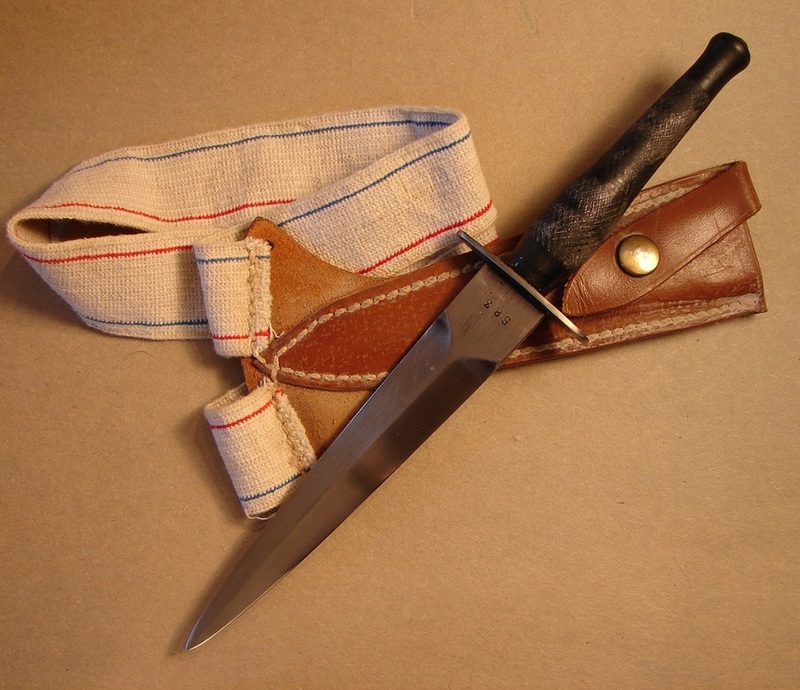 Below: A second example of what I refer to as a Lovat dagger. It has all of the finish polished off but the Wilkinson logo is quite clear. 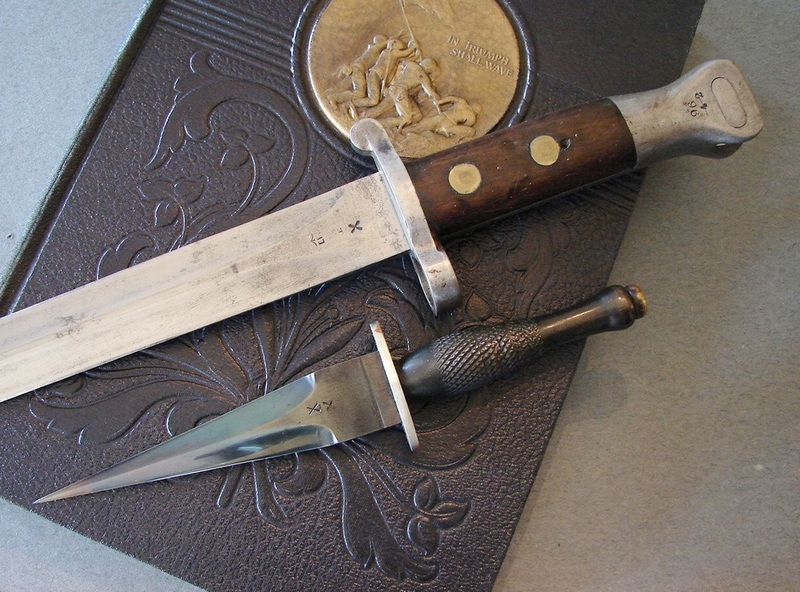 Lovat Dagger: Here is another fine example of the Agent's dagger with the aluminum handle and poignard shaped blade. The sheath is quite unusual and may be a replacement one. The guard is also aluminum. These knives are one of my favorite Wilkinson of all. 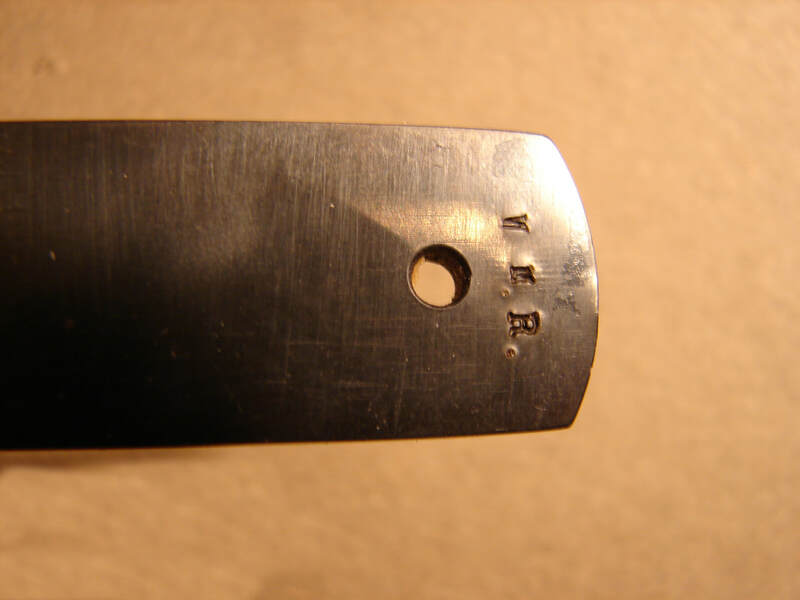 The image of the following knife has been posted on other forums and it is perhaps one of the rarest knives known to Fairbairn-Sykes knife collectors. This was W.E. 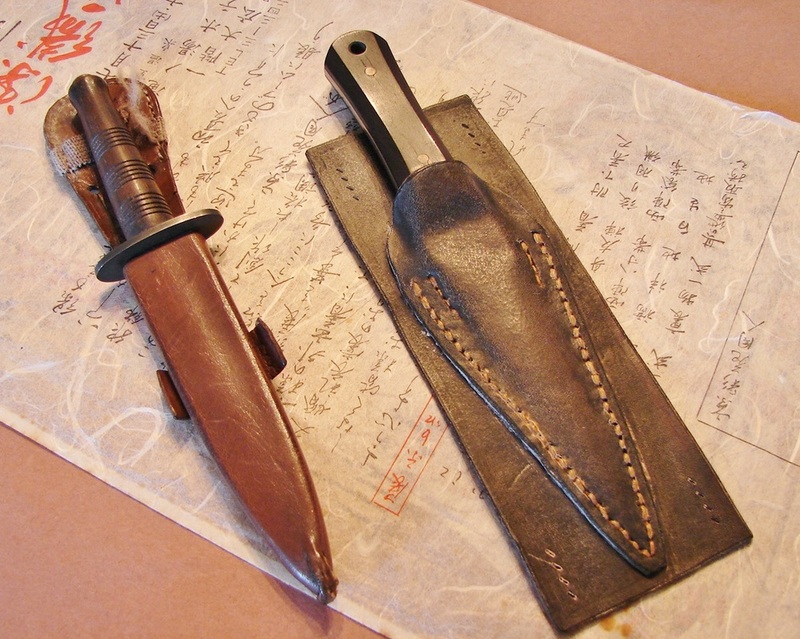 Fairbairn's personal Shanghai Dagger designed and presented to him by Sam Moore and Sam Yeaton. It is shown with its upside down carry sheath and engraved with the saying "THE GREATEST OF THEM ALL." This photo is posted here courtesy of Mr. Leroy Thompson and credited to him and Dorothea Fairbairn, W.E.F. 's daughter. 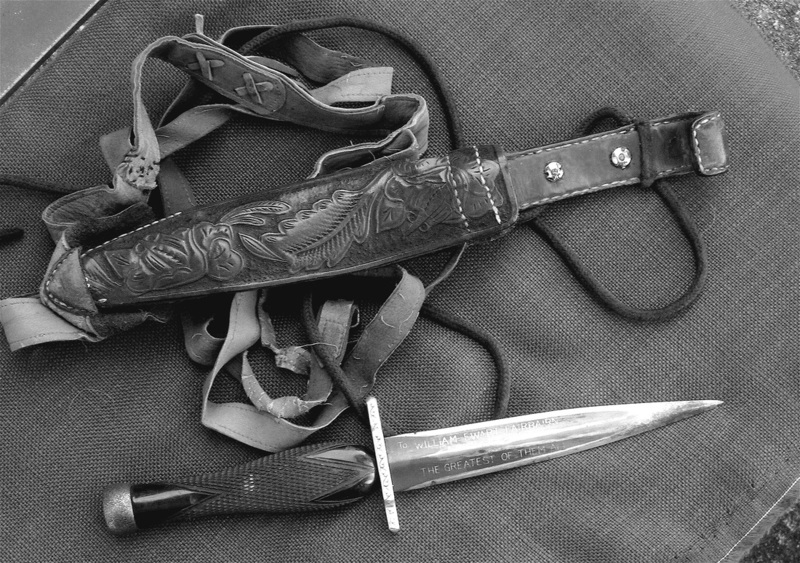 Despite all of the controversy, the Shanghai knives were undeniably made from bayonets by craftsmen at the Shanghai Armoury. Thank you Leroy for use of this photo. This is truly a priceless piece of history! The Fairbairn family referred to this as "The Mexican Knife," based, I assume, on the leather tooling. 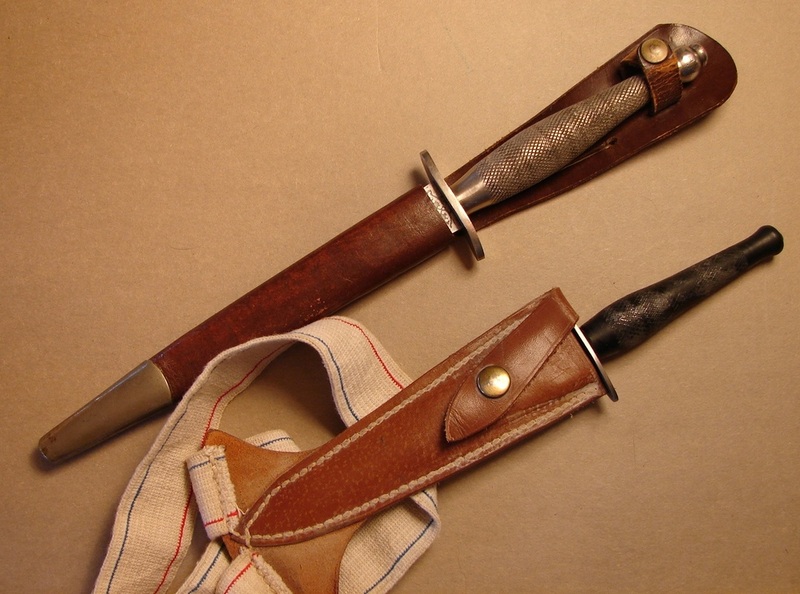 These two dagger are fitted with spike style blades. The top knife is about a 7/8ths size compared the a std. FS knife with a fairly low profile. The handle of the bottom knife is very similar to my "Faircane" swagger stick. (Check out the photos on the page for "Odds and Ends" for more about the Faircane) The bottom sheath is obviously designed to be worn on ones arm or leg. 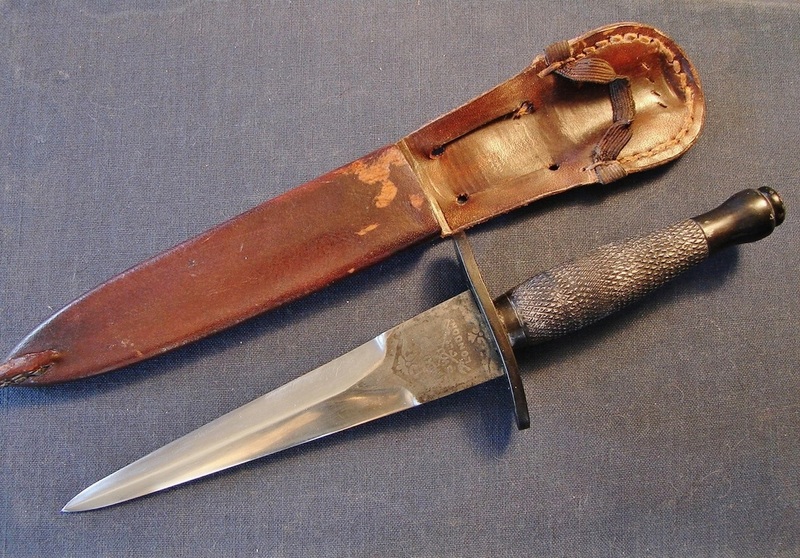 Similar sheaths have surfaced periodically that were supposedly issued to paratroopers and commando units, but designed for regular F-S knives. The edges/corners of the blade could inflict nasty cuts but both of them are obviously primarily stabbing weapons. Mini-Fairbairn Sykes knife by Bruce Hand? 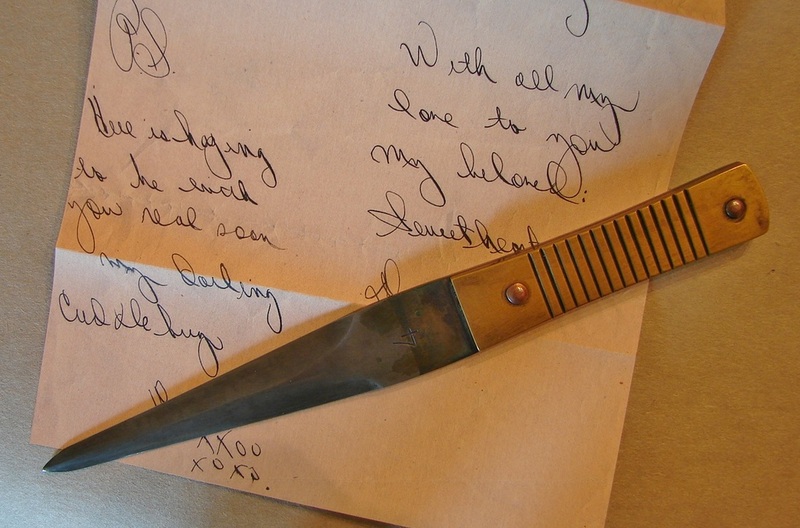 Below From Peter Mason's Collection: The following knife is one I purchased from the private collection of Leroy Thompson. He bought it directly from Capt. Peter Mason. It is one of the 7/8ths size "mini-FS" that were reportedly issued to some members of clandestine operations. It is marked with a serial number on one side of the ricasso. On the opposite side it is marked with the ampersand (&) that is attributed to the enigmatic Bruce Hand of Australia. A very tiny no.9 is also stamped into the German silver guard. The handle is knurled aluminum. The finely made blade is sharpened unlike most full size F~S. Left: The stampings are amazingly small. I do not believe I have ever seen stamps so tiny. Perhaps they are from someone in the jeweler's trade? The knife is very well made and extremely light, as you would expect. The sheath is designed for upside down carry, armpit or maybe hung on the chest? 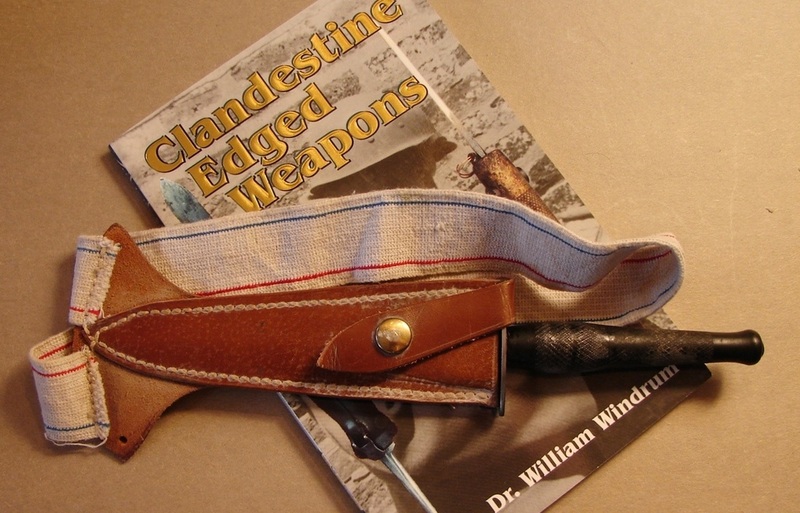 Below: Illustrated with Bill Windrum's book on "Clandestine Edged Weapons," this particular knife is not included in his book. 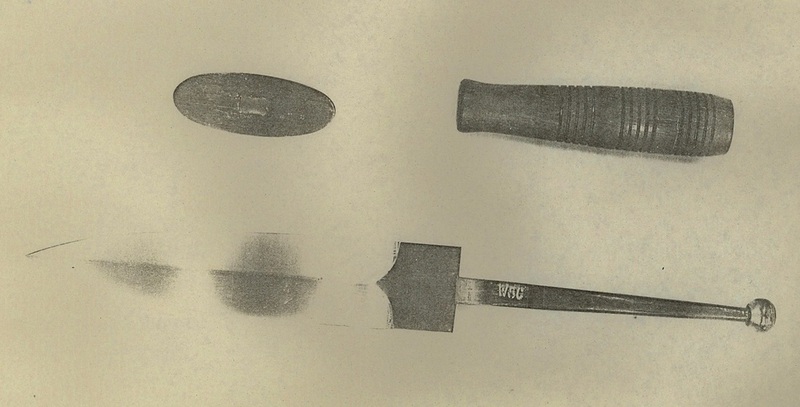 Many of Dr. Windrum's knives also came from Peter Mason, and vice versa. Below: Here is the Mason mini shown beside the Achnacarry First Pattern knife for a size comparison. Below: This mini-Fairbairn is also from Leroy Thompson and I am grateful for his willingness to offer it to me for our collection. 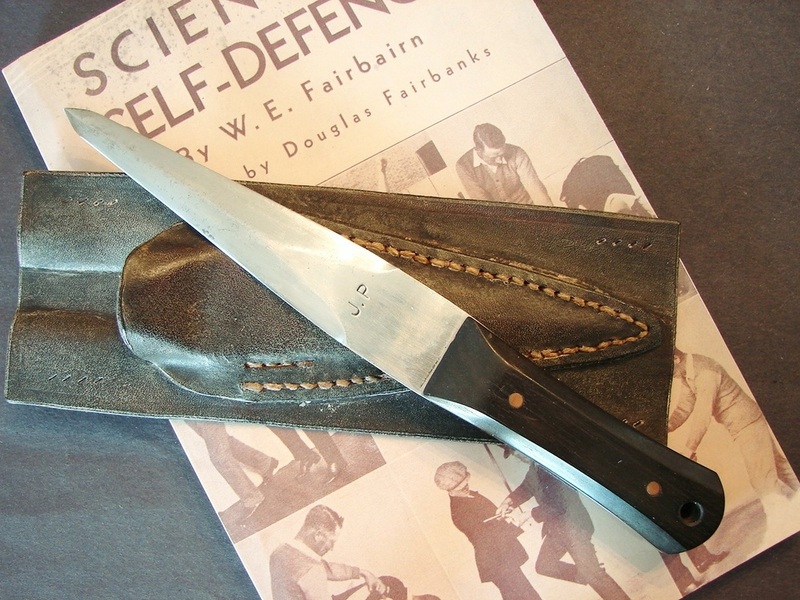 This one is of French design and came from the collection of a man in Belgium who specialized in clandestine knives. Leroy told me he traded for this knife, and several others, from the same collector about 30 years ago. You will note that the handle replicates the full size knives attributed to the French resistance movement. It is believed that the French minis were made by British makers, likely H.G. Long. Below: Here is the French mini-Fairbairn shown with a signed copy of Peter Mason's autobiography. It has a nicely blued, sharpened blade and knurled steel handle, and is fitted in a period sheath which I assume is its original one. 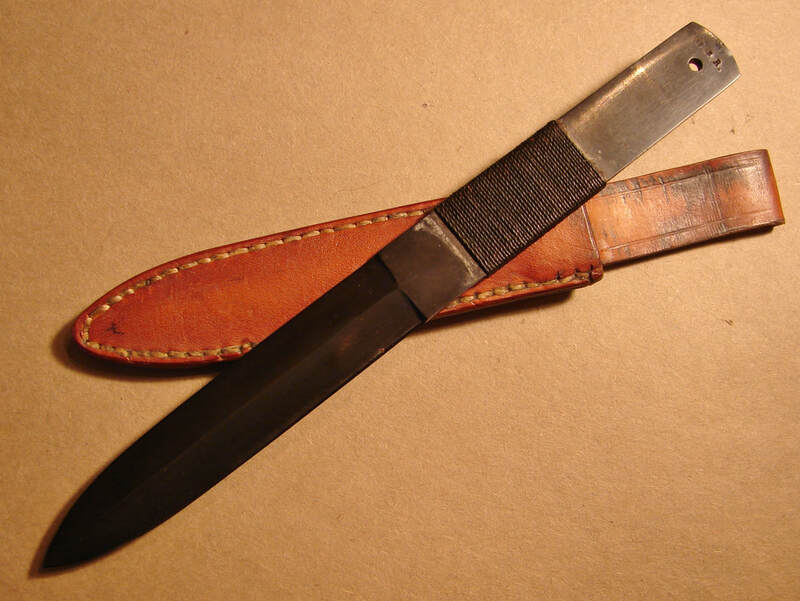 Often the sheaths are lost because they were sewn into the owner's clothing. If he were killed, or over time, the knives would be retained whereas the sheaths were not. Tiny number "9" stamped into the opposite side of the ricasso. Note the similarity in handle style, shape, and knurling pattern. between the full size and the mini. 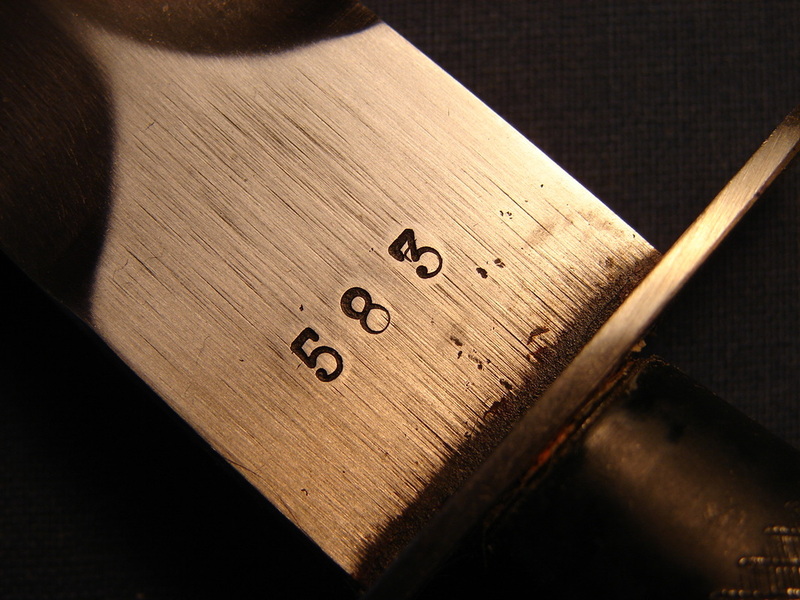 Similar number "9" stamped into the steel guard. According to some reliable sources the "9" is the code number for H.G. Long. Some people think these knives are nothing more than fantasy pieces or some sort of boy's toy. To put them in perspective, the blades range in size from a Gerber MKI to a Gerber Guardian. I don't think anyone would consider those knives toys! Remember these diminutive weapons were not designed for all out combat but were intended to be secreted on the Agent's person giving them a last ditch tool to escape capture and a painful death at the hands of the Nazis. Mason's book had only one printing in 1996. The British government curtailed its distribution and is probably responsible for Mason not publishing his second book. What a bloody shame! Below: Here is the last of the grouping of three mini Fairbairn-Sykes daggers. It is a very well made knife with a finely polished blade, steel cross guard, and smooth aluminum handle. It is all held together with a small top nut. I am not sure what the stains are on the blade. They do not seem to be in the metal, but on the metal, as they are not detectable by my fingernail. This Polish dagger has a very solid feel to it, and according to Leroy Thompson was one of his favorites. While such diminutive knives might seem useless for defense, there is a very good feel to this one. The pommel nestles comfortably in the hollow of the palm of your hand. This would allow the user to inflict a very serious thrust similar to using a push dagger. I really like this knife. 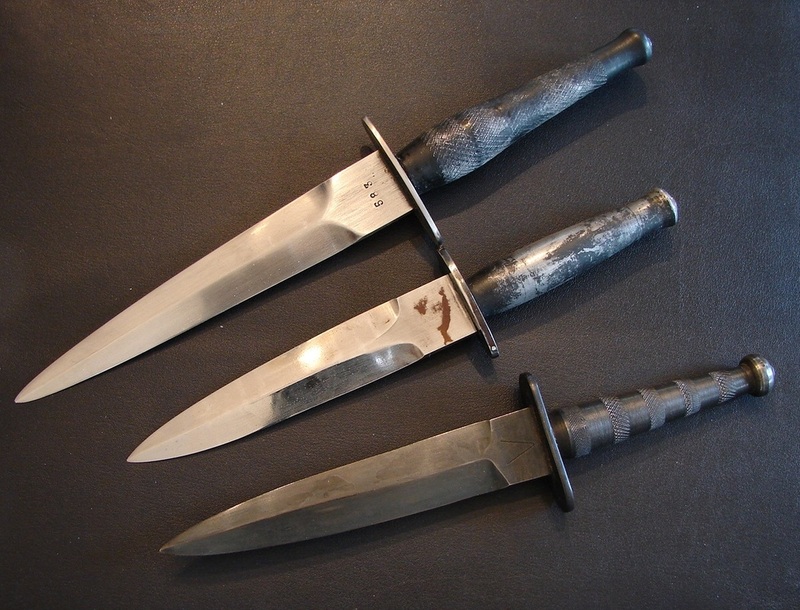 Below: Here they are, all together again, top to bottom, the Peter Mason dagger by Bruce Hand, the Polish knife, and lastly the French model. One person commented that the blades looked suspiciously similar. As if that was some sort of proof of conspiracy to counterfeit these knives. My response to that is: the blades on the 350,000 plus third pattern knives look suspiciously similar too. 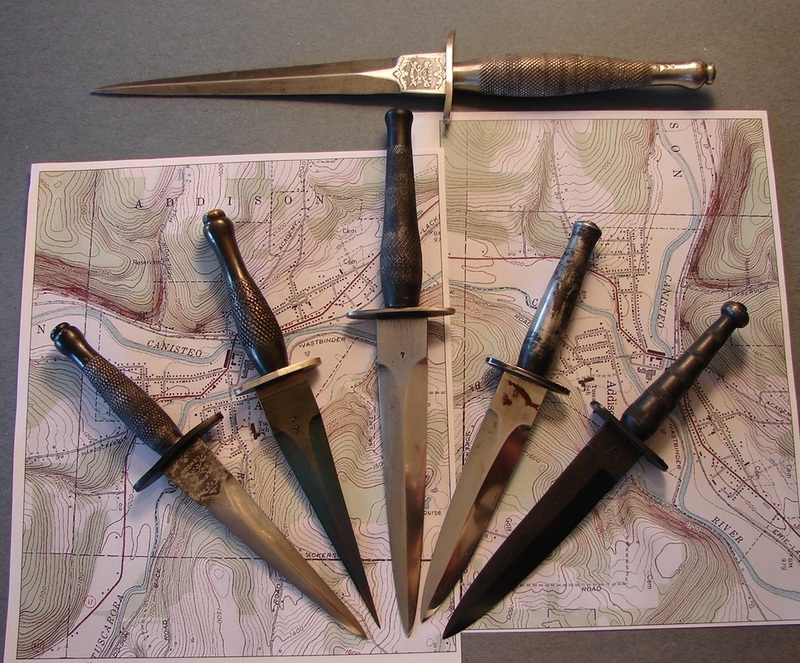 As another example of this, check out the group of four knives on the page for "Post-War" knives. It was not uncommon for one manufacturer to provide blades or mounted knives to other retailers to sell under their name. Two More Minis Below: Here is a photo of the totality of our collection, now numbering five minis. They are illustrated with the full-size Achnacarry Dagger for a size comparison. More details on the two latest minis (on the left in this photo) are posted below. 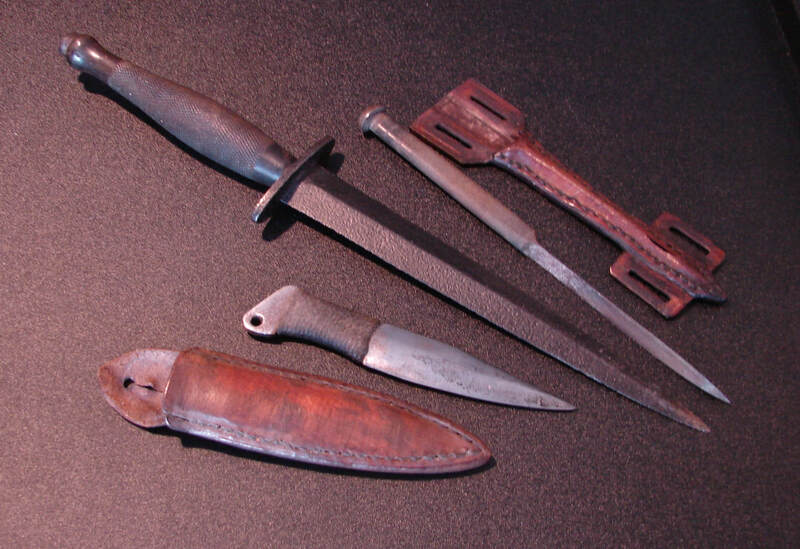 The knife on the far left, and shown below, is quite unique. It was fashioned from a broken First Pattern Wilkinson Sword knife. 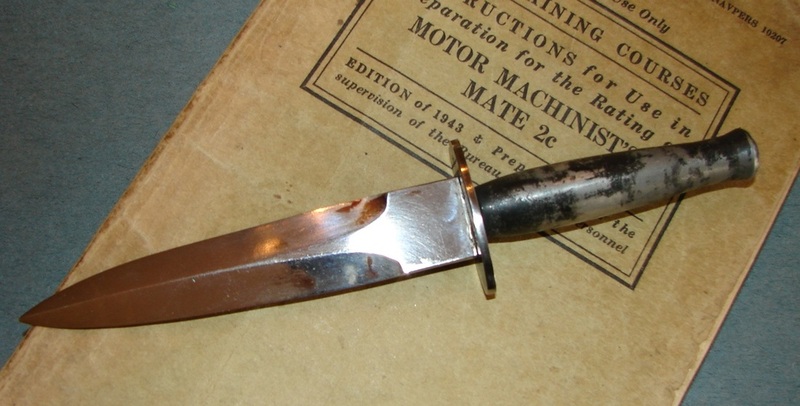 The story is that an enterprising tool and die maker during World War II collected up cast off blades from broken commando knives and would re-grind them. He then turned new handles proportional to the smaller blades and mounted them with guards and top nuts. 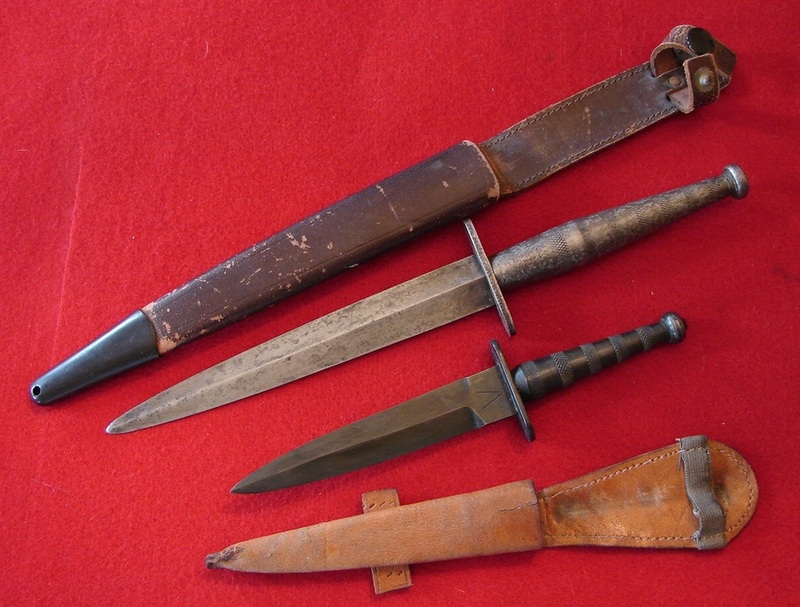 The resulting knives were sheathed and provided to troops in need of a knife. The steel guard appears to be the original, and the new handle is made from brass and knurled like the full-size knives. The sheath is made from a thin leather very similar in style to the one with the French Mini. The knife second from the left in the group photo, shown below, is one of my favorites. It is made from a 1903 bayonet with all of the appropriate stamps on the ricasso. It is a gem of the grinders art. The blade is perfectly symmetrical and heat blued. A guard was fashioned from aluminum and perfectly fitted. A knurled brass handle gives the knife an excellent heft. It is fitted into a pouch style sheath formed of high quality leather. The knife has two "X" stamps which is curious. 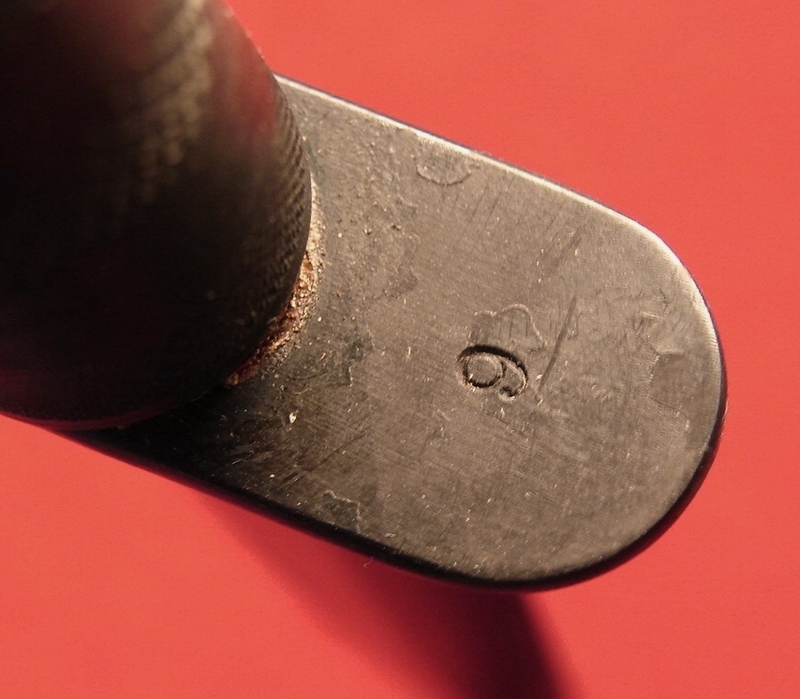 One is the standard Bending test proof mark.